Slowing growth in the online marketplace weighed on the shares toward the end of the year. Shares of eBay (NASDAQ:EBAY) declined 25.6% last year, according to data from S&P Global Market Intelligence. The online marketplace entered 2018 with momentum after posting accelerating growth in gross merchandise volume (GMV) to finish 2017. However, that momentum was short lived as eBay struggled to build on that growth and experienced a deceleration in GMV during the third quarter of 2018. After peaking at $46.99 in early 2018, the shares tumbled to a 52-week low of $26.01. eBay's slowing growth comes as larger rivals like Walmart have been investing heavily in e-commerce and seeing skyrocketing growth. This makes eBay's decelerating, low-single-digit growth look weak in comparison, which seems to have contributed to the stock's slide last year. In December, Morgan Stanley downgraded the stock and cut the price target on the shares from $55 to $33, citing the slower-than-expected growth in eBay's GMV in recent quarters, which the firm expects to weigh on the stock price in the short term. On the bright side, eBay is very profitable, having generated $1.7 billion in free cash flow over the last year on $10.2 billion in revenue. Management plans to scale back spending on marketing going forward, since the increase in marketing expense, which has weighed on operating margin, didn't deliver the expected returns recently. This should allow earnings to grow faster in the coming quarters. 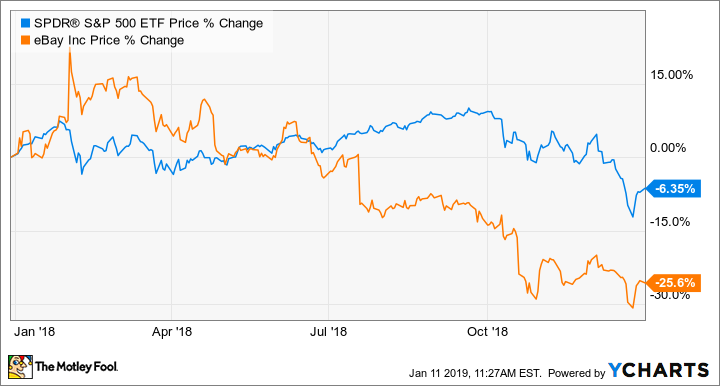 Analysts currently expect eBay to grow revenue and non-GAAP earnings per share 4.8% and 12.6%, respectively, in 2019. With eBay stock trading at a forward price-to-earnings ratio of just 11.6, the downside appears limited at this point. If the company can deliver growth consistent with those estimates, the stock could rebound over the next year. Check out the latest eBay earnings call transcript.